What are the best grass seed choices for different athletic sports fields? There are few subjects that come close to equaling the magnitude of sports. For many people, sports rank right up there with religion, politics and relationships on the importance scale. Occasionally sports can dominate the attention of the world in the form of the Olympics, World Cup or Super Bowl. But one crucial component of sports often gets overlooked – the playing field. Rarely does a sports field receive any special attention from players or fans unless something’s wrong with it. Little do folks understand the countless hours of preparation that go into a professional athletic field. Professional turfgrass management is a rigorous science and art, working behind the scenes to provide the best playing surface possible for athletes. Each sport is unique and utilizes the playing field in unique ways. Because of this it’s important to understand which types of grasses are best for each sport. While artificial turf has been slowly gaining popularity on the football field, most players still consider real grass fields superior. Studies have shown that injuries on real grass fields are less common than on artificial turf. Real grass football fields also tend to be much cooler than artificial turf fields. Unlike other sports, there’s not much contact between the playing field and the ball. This allows for a broader use of grasses with consistency playing a smaller role. In the northern United States, there are three types of cool-season grasses primarily used for football fields: Kentucky bluegrass, tall fescue and perennial ryegrass. In the South,bermudagrass is the most commonly used grass for football fields. Tall fescue works great in transitional climates. When establishing a football field in the North, a blend of 80% Kentucky bluegrass and 20% perennial ryegrass is ideal. This is the same ratio found in our famous Blue Ribbon Blend. No other sport has such a wide variety of playing surfaces. While there are official guidelines that regulate tennis courts, there is no rule about what the surface of the court can be made of. Tennis can be played on clay, wood, concrete, gravel, and other surfaces. 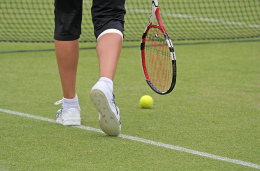 However, some of the most well-known tennis tournaments, including Wimbledon, are played on grass. Traditionally, professional tennis courts in northern climates have been a blend of 70% perennial ryegrass and 30% creeping red fescue, although recently groundskeepers have opted for 100% perennial ryegrass surfaces. Creeping bentgrass is also commonly used for grass tennis courts. These grasses are usually maintained at a height of ¼ inch. In the South, bermudagrass is once again the best choice. No other sport manipulates, maintains or depends on its grass playing area more than golf. And in no other sport are there more types of grasses used. Every aspect of golf is heavily influenced by the type and quality of the grass on the course, from the way the ball rolls to the way you swing your club. On northern golf courses, Kentucky bluegrass and perennial ryegrass are commonly used for fairways and tees. These grasses are able to recover quickly from damage and tolerate short mowing heights. Creeping bentgrass is used for greens. In the South, bermudagrass performs well as both a fairway grass and on the green. Other golf course grasses used throughout the country include zoysia grass, bahia grass, fescue, and St. Augustine grass. Some golf courses are even experimenting with buffalograss as a sustainable, water-wise fairway grass. Sports such as baseball, soccer, rugby, cricket and lacrosse all have similar requirements for their grass playing fields. Traffic tolerance, consistency and damage repair rate are the most important factors. 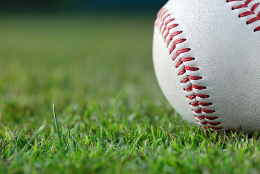 For these sports, Kentucky bluegrass is the best choice for northern areas of the United States. Blends that include 10-20% perennial ryegrass will establish quicker and fill in damaged areas faster. For the South, bermudagrass will be the number one choice for athletic fields. During the winter, dormant bermudagrass can be overseeded with perennial ryegrass to provide use year-round.